The first trailer for Prince Harry and Meghan Markle movie is HERE! Shortly after Prince Harry and Meghan Markle confirmed their highly anticipated engagement came the news that their love story was being turned into a juicy Lifetime movie. It was thought to be similar to the 2011 Lifetime movie about Prince Harry’s older brother Prince William and his soon-to-be-bride Kate Middleton, following the couple on their fairy-tale romance from the moment they met to the proposal itself… and everything else in-between. We’re excited that the first trailer for the movie has arrived – just what we needed on a Monday – and we have to say that we are hooked already! The actors stepping into Prince Harry and Meghan Markle’s shoes (The Loch's Murray Fraser and Jessica Jones' Parisa Fitz-Henley respectively) have done a remarkable job from what we can see so far – the Meghan Markle resemblance, in particular, is almost uncanny, don’t you agree? The movie will reportedly take viewers on the very romantic journey of their love, including the moment they met after being set up on a blind date by their friends, to how they kept their relationship hidden for so long, to how they handled the scrutiny after everything became public. 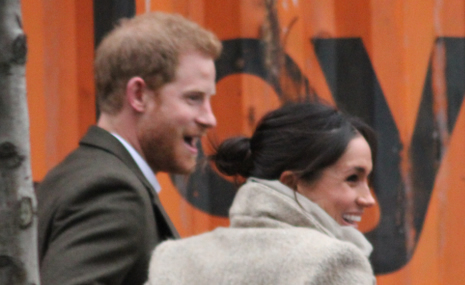 Remember the backlash Meghan Markle received about being divorced and mixed race?! It looks like viewers are in for one heck of a ride, and the trailer has done a great job of teasing us and leaving us wanting more. "Harry & Meghan: A Royal Romance" premieres on Sunday, May 13 to gear us up for the Royal Wedding on May 19, but we’re hoping to have a few more trailers to tide us over until then. What are your thoughts on the faux Harry and Meghan? Convincing? 1 responses to "The first trailer for Prince Harry and Meghan Markle movie is HERE! " I'm very excited to see this movie.